The rare entity of Rowell's syndrome (RS) describes lupus erythematosus (LE), erythema multiforme (EM) like lesions, speckled antinuclear antibodies (ANA) with any to all of antiRo/La antibodies, rheumatoid factor, and chilblain. Anti-phospholipid syndrome (APS) entails thromboses, pregnancy complications such as recurrent fetal loss, preterm delivery, placental insufficiency and antibodies to phospholipids, cardiolipin, β2 glycoprotein, etc. We report the concurrence of these two syndromes with the sensorineural hearing loss (SNHL) and primary infertility. A brief review of RS and analysis of data of all reported cases from India hereto vis-a-vis that of cases worldwide has also been attempted. A 32-year-old housewife, unable to conceive for 7 years of marriage despite twice attempted in vitro fertilization and four cycles of oral clomiphene citrate and dydrogesterone tablets, presented with raised patches and plaques, some of the latter with cicatricial alopecia, over the scalp for 6 months. During the preceding month similar lesions in a photosensitive distribution, particularly itchy on exposure to sun, had appeared on her trunk and limbs. Simultaneously, occurrence of painful intraoral (buccal mucosa, palate/tongue) ulcers, swelling of both hands, arthralgia/myalgia and listlessness, ocular (watering, burning, and reddening) complaints, and loss of hearing made her seek dermatological consultation. General physical examination revealed pallor. Systemic examination was normal. Dermatological examination [Figure 1]a,[Figure 1]b,[Figure 1]c,[Figure 1]d,[Figure 1]e,[Figure 1]f revealed over scalp few (~10) dyspigmented macules and discoid plaques; the largest -3 cm×3 cm - over occiput with central atrophy, follicular plugging/accentuation, and scarring alopecia. Multiple dusky scaly macules/plaques were present in a photosensitive distribution over face, upper trunk, and upper limbs. “Targetoid” lesions – somewhat “faded” – were seen over the palms; said to be present since a fortnight. Metacarpophalangeal and proximal interphalangeal joints were tender. Hair was dry, brittle, and lusterless (lupus hair) over frontoparietal margins. Oral mucosa (buccal, hard palate, tongue, and lips) had multiple dyspigmented, at places, fissured patches. Laboratory investigations revealed hemoglobin, 8.3 g/dL; white blood cell, 3400/mm3; erythrocyte sedimentation rate, 39 mm/1st h; rheumatoid factor, positive; ANA, 133U/ml; ANA blot, speckled on immunofluorescence, positive for SMD-1, SS-A/Ro, SS-B/La, U1-sn RNP; and Ku; antiphospholipid and anticardiolipin antibodies were positive. Pure-tone audiometry confirmed sensorineural deafness. Histopathological examination of the scalp lesion was opined as discoid LE [Figure 2]a,[Figure 2]b,[Figure 2]c. Overlap syndrome with Rowell's and antiphospholipid antibody syndromes, primary infertility, and SNHL was the likely diagnoses given to the above clinical, histopathological, and serological findings, though the latter lacked direct immunofluorescence study of the targetoid lesions due to unaffordability. Administration of daily oral prednisolone (20 mg), hydroxychloroquine (200 mg), along with application of mometasone furoate (0.1%) ointment and broad-spectrum sunscreen led to significant relief within a fortnight. She was discharged on request, giving a written referral to the specialist in reproductive medicine and advised follow-up with us and the rheumatologist. However, for want of follow-up by the patient, confirmation of APS by repeat testing of antiphospholipid and anticardiolipin antibodies could not be carried out. Bhobe et al. stated that Scholtz first reported in 1922 a case of LE with EM. The diagnostic criteria [Table 1] initially proposed in 1963 by Rowell et al. – for a syndrome (considered the first in the connective tissue disorders and later eponymously designated after Rowell) in four adult female cases from among their 120 discoid LE patients have been subsequently amended thrice. Even the existence of RS or at least nosographic independence from LE was questioned; some considering the association to be merely coincidental; others, a form of subacute cutaneous LE and still others– LE associated Steven–Johnson syndrome/toxic epidermal necrolysis. Heretofore seventeen cases of RS have been reported from India [Table 2], ours being the eighteenth. Salient findings on an analysis of data of these eighteen cases from India vis-a-vis that of the 95 cases reported worldwide until 2012 are presented in [Table 3]. Earlier Khandpur et al. had reported two cases of RS and compared their findings with those of the eighteen cases of this syndrome up to 2000 worldwide. Unlike Madke et al. who proposed only Ro/La antibodies as a criterion (minor), our analysis of the cases of RS from India revealed the most common ANA (10; 55.56%) to be anti-dsDNA with concurrent lupus nephritis in three (16.67%). Fourteen (77.78%) of the Indian cases had speckled pattern ANA; one negative for ANA had Ro/La antibodies. The immunoflourescence pattern was not done in the remaining three who had raised ANA titers. Rheumatoid factor was positive in 12 (66.67%) of the Indian patients. 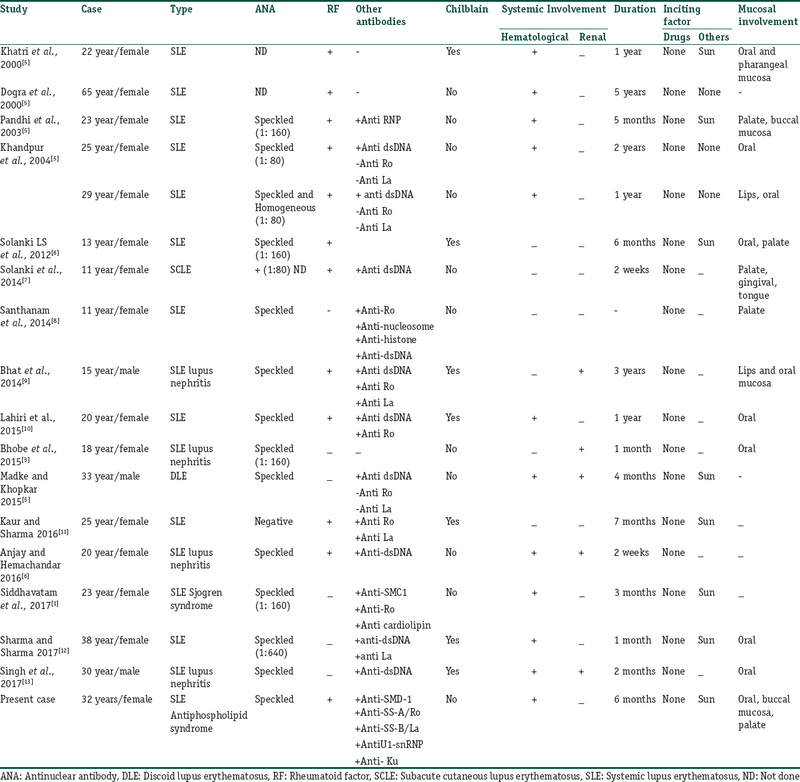 The involvement of systems in the Indian cases was more common than that in the reappraised worldwide cases [Table 3]. APS is defined by the presence (twice with a minimal interval of 6 weeks) of antiphospholipid antibodies and associated phospholipid-binding cofactor proteins and/or a circulating lupus anticoagulant together with clinical manifestations such as thrombosis, recurrent spontaneous abortions, etc. McCabe, in 1979, first reported rapidly progressing bilateral SNHL in this syndrome and postulated autoimmunity to be potentially pathogenetic, best understood by analyzing the nature of the thrombotic process over its time course and size of the involved vessels. Thrombosis could result from thrombotic microangiopathy or ischemia — initiated primarily by activated endothelial cells or secondarily by induced free radicals. Isolated inner ear disease might involve small vessels of the labyrinthine circulation. Binding of the antiphospholipid antibodies to β2 glycoprotein is not only well established as a cause of fetal loss but also has the potential to cause faulty implantation, placentation and even early embryonic development by breaking down the phospholipid adhesion molecules between different elements of trophoblast. Lupus anticoagulant and anticardiolipin antibodies have also been implicated in the prothrombotic effects of APS. Our case – ostensibly the eighteenth of RS from India and the first reporting its concurrence with APS, primary infertility and SNHL with overlap syndrome –who initially presented for management of infertility to the concerned specialist, continued to suffer from ongoing stress as the possibility of APS got overlooked. Not only did infertility and SNHL continue to progress, overlap syndrome and RS also got precipitated. Hopefully, this report reiterated the need for heightening the index of suspicion of this rare association. Siddhavatam C, Kekathi V, Saifullah QS, Kakarla S. An interesting case of systemic lupus erythematosus – Rowell's syndrome. JNTR Univ Health Sci 2017;6:60-3. Carp HJ, Shoenfeld Y. Anti-phospholipid antibodies and infertility. Clin Rev Allergy Immunol 2007;32:159-61. Bhobe MR, Tambe S, Jindal S, Jerajani HR. Rowell's syndrome to ds-DNA negative lupus nephritis: A yet unreported progression. Indian J Dermatol 2015;60:215. Torchia D, Romanelli P, Kerdel FA. Erythema multiforme and Stevens-Johnson syndrome/toxic epidermal necrolysis associated with lupus erythematosus. J Am Acad Dermatol 2012;67:417-21. Madke B, Khopkar U. Rowell's syndrome in an Indian male and review of the literature. Indian Dermatol Online J 2015;6:S12-6. 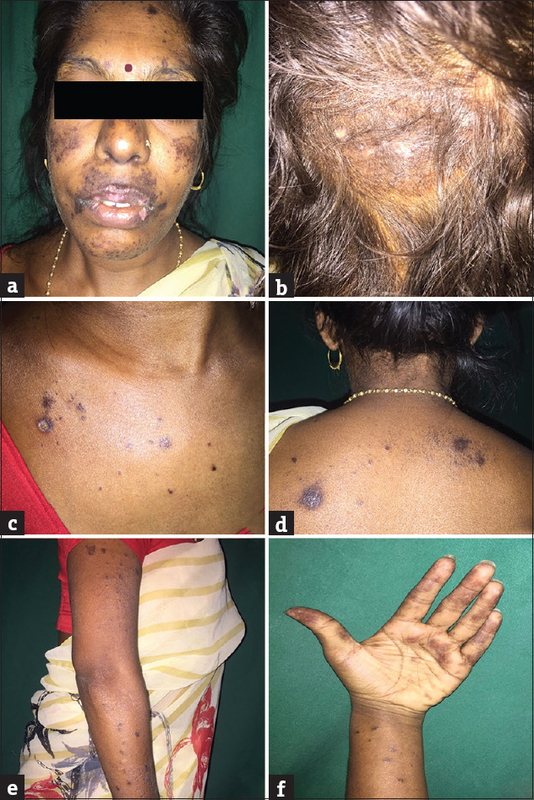 Anjay B, Hemachandar R. Systemic lupus with erythema multiforme-so called Rowell's syndrome. Int J Multidiscip Curr Res 2016;4:12-3. Solanki D, Dalal E, Darji N. Case report of a Rowell's syndrome. Int J Sci Res 2014;3:7-8. 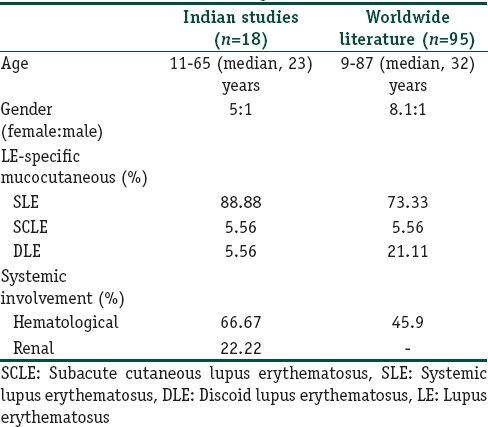 Santhanam S, Madeshwaran M, Sankaralingam R. Rowell's syndrome: A rare presentation of childhood lupus. Internet J Rheumatol Clin Immunol 2014;2:V4. Bhat RY, Varma C, Bhatt S, Balachandran C. Rowell's syndrome. Indian Dermatol Online J 2014;5:S33-5. Lahiri D, Agarwal R, Mondal D, Hajra A, Sarkar N, Mukhopadhyay J. Rowell's syndrome: A case report and review of literature. JCR 2015;5:163-5. Kaur T, Sharma N. Lupus erythematosus with erythema multiforme like lesions: Rowell syndrome; a clinical or histological diagnosis? J Turk Acad Dermatol 2016;10:16101c6. 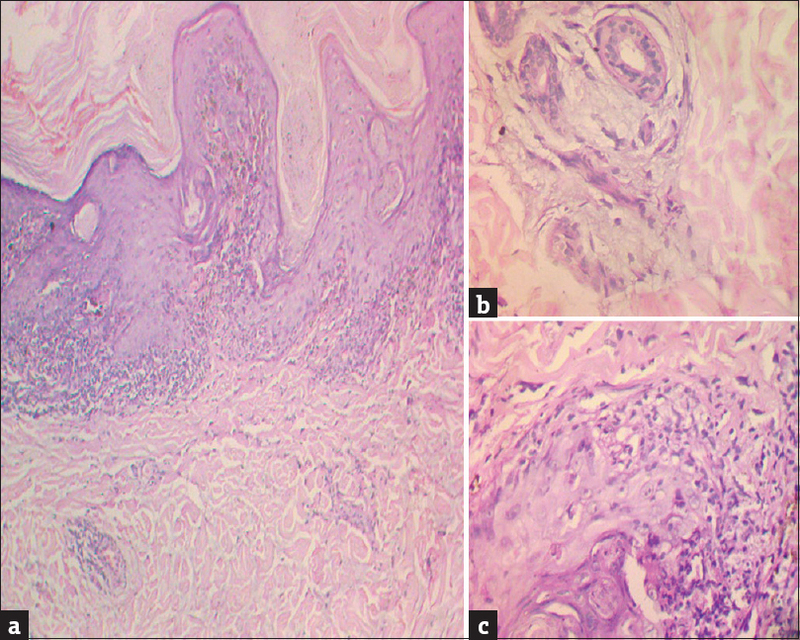 Sharma A, Sharma R. Rowell syndrome: A case report and review of literature. IJRCI 2016;4:CS6. Singh P, Verma S, Meena LP, Chakravarty J, Rai M, Sundar S. Rowell syndrome in male: A rare case report. World J Pharm Med Res 2017;3:202-3. Mouadeb DA, Ruckenstein MJ. Antiphospholipid inner ear syndrome. Laryngoscope 2005;115:879-83.